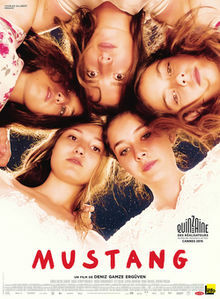 We went on Saturday to the Turkish film Mustang , which tracks the passage from childhood of five girls. The girls live with their uncle and grandmother (the parents have disappeared, perhaps dead) in quite a rural area, 1000 km from Istanbul. In the first phase of the film they are carefree and vivacious, larking around with boys at the end of school term and chattering non-stop with each other. Gradually the tenor of the film changes, as the older people assert traditional cultural mores. Two of the girls are married off to boys they only meet on the day of the betrothal. The others resist in various ways, but the house is turned literally into a prison, as bars are nailed across the windows, and locks turned. The atmosphere of the film turns steadily darker, as the clash of generations and cultures catches the girls in its grip. The film is far from perfect (though we differed in our ratings). I found the girls too beach-Californian in appearance, and there are several points of total implausibility – indeed the film doesn’t really pretend to plausibility, but this makes it quite hard to gauge the strength of its critique. But it’s a very powerful insight into the stresses of growing up in a country where there are such conflicting pressures. Turkey is right at the crossroads of a number of huge tensions – military, political and cultural, as well, obviously, as the enormous stress provoked by the Syrian crisis. I have no detailed knowledge of the country, or sympathy for the current regime there, but my perception is that its treatment at the hands of the West has been exploitative and often duplicitous, most notably a decade or more ago on its supposed access to the European Union. Education may be helping them cope with these stresses; but it may also drive some of them. Women in Turkey have not yet quite caught up with men in their educational achievement. But is in other OECD countries, that is the inevitable trend. Girls of the Mustang generation will be outperforming their male equivalents. Their parents and grandparents may seek to maintain the old traditions, but it will be a rough ride.